This is a wonderful paisley-inspired printed heavy challis dress in excellent condition. 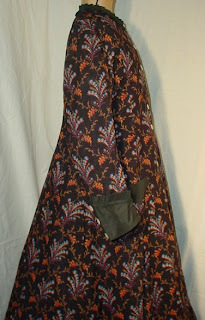 Though there is no actual "paisley" in the design, bptj the colors and Eastern-inspired print, in shades of tan, blue, orange, red, and white, on a dark brown background, show the widespread influence of the hugely popular Paisley shawl. 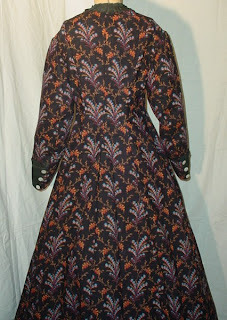 It's piped at the shoulders, has two patch pockets, closes with shell buttons. The bodice area is lined with white cotton. 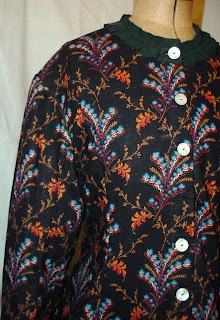 The sleeves, collar, and pockets have been trimmed with black silk, the sleeve in the Colonial Revival style, adorned with 3 shell buttons. The black silk trim seems to have been added later, and looks, at least in the case of the collar, to be able to be removed to reveal the original fabric underneath. True colors are shown in the closeups. 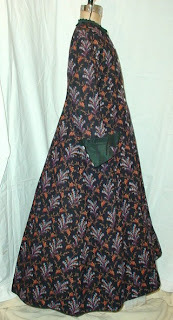 It measures 38" around the bust, 33" at the waist, it's 54 3/4" measured in back from the collar seam to the hem, sleeve length is 22". 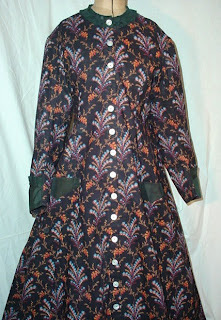 Very good to excellent condition, with one missing button, which I will provide a similar, one small flaw to the fabric visible near the button area at the top. 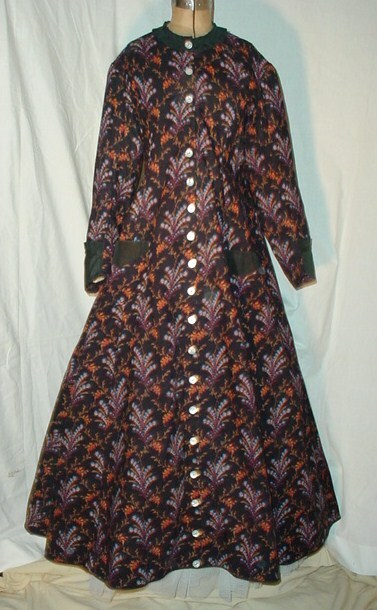 This looks 1870's to me but I might be a decade off either way.